What a shame, it's always disappointing to go into a book that friends have loved, only to find that you don't feel the same. I haven't heard of this, but I adore the cover! Not connecting with or liking the main protagonist can be the source factor that determines whether we like a book or not, as I've experienced many times. And although I've seen plenty of positive reviews for this and still plan to read it (I'm a hopeless cause for fantasy books with cats as the side-kick, haha!) I'll definitely keep your dissenting opinion in my mind. Splendid review, love! 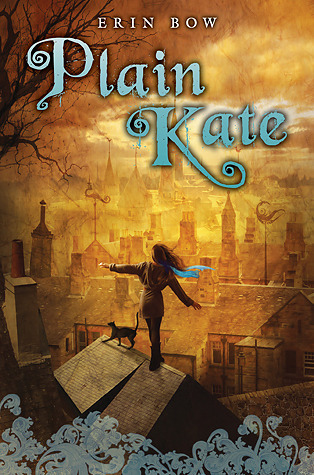 I hadn't heard of Erin Bow or Plain Kate before; it's a shame you didn't enjoy it, but pretty positive to feel the author's got enough talent to try some of their other works. Hah! Well, if the writing isn't immersive and the story isn't caprivating, there really isn't much else to say! I remember Catie liking this one, but she was pretty much the only one and she's extremely patient. I doubt this is a bok for me. Aside from a few books, we tend to enjoy the same things. Aww, sorry this one isn't what you hoped for. I hope your next one is better. I know how you feel when you read a book that everyone else loved... that happened to me with Unspoken. I am a patient reader but perhaps all the woe won't be for me. I know I don't have time to check it out right now either way so it isn't an issue. THanks for being honest! I loved this book but I know the feeling about feeling in the minority when not liking a book. I didn't like Where Things Come (or was it When Things Come Back?) but it seems like the entire world RAVED about it. Then I gave ut to someone and they strongly disliked it too. I kinda felt better knowing I wasn't just an idiot. At least not the ONLY idiot. Lol. I'm sorry this one didn't work for you, Keertana! Now you have me nervous. Like you, I've heard mostly absolute praise for this book, so I'm surprised when it falls so flat for such an avid fantasy fan. I do still plan to give it a go at some point, but I might not go in ready to be swept away! But how can a story with an evil albino wizard be boring?! Is that even possible? I am really surprised to see this, because like you, so many of my friends LOVE this book and recommended it to me. I'm sorry it was a disappointment, but I must say I'm grateful to have read your review. Always better to temper expectations. I will always remember this book, not just for the fairy tale that was dazzling to read but for the book as a whole and it will be one of the 5 that I read over and over and over again until the pages are dog-earred and dirty.